The Tories know that they're deeply unpopular with the younger generations, but instead of offering young people anything like actual reasons to vote Tory, numerous Tory MPs have secided to begin publicly promoting an extremely dodgy far-right propaganda outfit called Turning Point that has been imported directly from the United States. The US chapter of this youth radicalisation programme has links to racists and white supremacists, spreads the anti-Semitic Nazi era trope of "cultural Marxism", and created a 'hit list' of supposedlty left-wing University professors for their followers to send abuse and death threats to. Aside from their despicable tactics and dodgy political associations, the US Turning Point movement also have a propensity for ludicrous self-owns like the time they triggered universal ridicule for dressing themselves in diapers at Kent State University to protest against the concept of safe spaces. 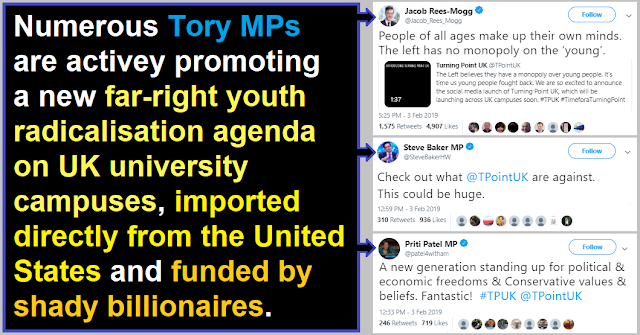 There's absolutely no way that these Tory MPs can pretend that they don't know who is behind this far right youth radicalisation programme given that the founder has pumped £100,000 into Tory party coffers since 2017. 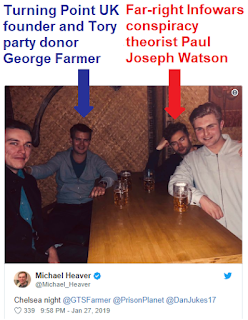 And there's no way they can deny the links between this organisation and extreme-right propaganda outfits like Infowars and Breitbart, especially given the photographic evidence that the Turning Point UK leadership are associates of Infowars propagandist and soy salesman Paul Joseph Watson. The Turning Point UK agenda is obvious. They're funnelling huge amounts of cash from dodgy mega-rich donors into efforts to radicalise young people on university campuses using the age old fascist technique of pretending that they're being censored in order to get the victimhood and self-pity vibe really going. Tory MPs to have actively promoted this grotesque propaganda operation include Jacob Rees-Mogg, Priti Patel, Bernard Jenkin, Anne-Marie Trevelyan, and Steve Baker. Noticeably all five of these Tory figures are Brexiteers, which makes their backing of a US-based mainly US-funded far-right indoctrination programmes on UK campuses seem rather unusual. How can a bunch of people who never stop banging on about the importance of British sovereignty be so enthusiastic about the spread of imported far-right propaganda into British universities and British political discourse? The answer is simple. They never actually gave a damn about sovereignty and simply saw Brexit as a convenient Trojan Horse to push their own radical right-wing agenda of scrapping workers' rights, food standards, environmental laws, freedoms from persecution, and consumer protections. Thus their support for imported far-right Turning Point propaganda outfit derives from the fact that they're ideological blood brothers all pushing the same radically right-wing political agenda. When UKIP attempted to jump on the alt-right bandwagon by signing up right-wing Youtubers like Carl Benjamin (Sargon of Akkad), Paul Joseph Watson (Prison Planet), and Mark Meechan (Count Dankula) people saw it as a last desperate effort of a dying political party to remain relevant. Now that the Tories are embracing far-right propaganda tactics things are a lot more serious. This isn't just the crumbling edifice of Nigel Farage's publicity vehicle embracing the extreme-right in a desperate effort to remain relevant, it's the actual party of government embracing the extreme-right to try and stay in power. The last time we saw the British government embracing extremism to such an extent was the 1930s when Tory MPs signed up in droves to pro-Nazi and anti-Semitic groups like The Right Club and the Anglo-German Link. Scroll forward eight decades and the majority of Brits who made such enormous sacrifices to beat fascism during the Second World War have passed away, our cultural memory of the horrors of Nazism is fading, and imported fascism and anti-Semitism are right back in fashion in the Tory ranks. Anyone who is not concerned by this latest Tory lurch to the extreme-right is just as complacent as those who ridiculed Winston Churchill and the anti-fascists in the 1930s for warning of the dangers back then. "The Turning Point UK agenda is obvious."